Launchkey is a range of keyboard controllers with up to 50 physical controls including 16 velocity-sensitive multi-colour launch pads that trigger clips and scenes in Ableton Live. Launchkey is a range of keyboard controllers with up to 50 physical controls including 16 velocity-sensitive multi-colour launch pads that trigger clips and scenes in Ableton Live. As well as enabling hands-on control of your DAW’s mixer, transport and more, Launchkey is an integrated software/hardware instrument. The control surface has been designed to work tightly alongside two intuitive apps for iPad: the Launchkey app and the Launchpad app - plus the powerful V-Station & Bass Station synth plug-ins for Mac and Windows. Launchkey is a fully featured DAW control surface with over 50 hardware controls (34 on the 25-note version). The result is more than a USB controller keyboard; it's a powerful integrated instrument with more hands-on control than any other device in its class. In addition to the integrated instrument functionality, standard MIDI control is also provided, making it an ideal partner for a digital audio workstation, giving you instant control of track volumes, panning, sends and other settings with Novation’s InControl software integration system. The 16 dual-colour backlit launch pads are velocity-sensitive and can be used to play drums and trigger loops in your software as well as launching clips and scenes in Ableton Live. 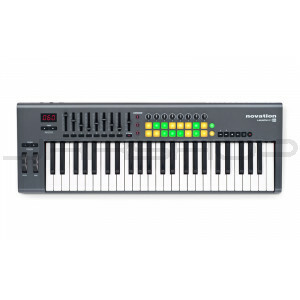 Three Launchkey models are available, with 25-, 49- or 61-key velocity-sensitive synth-action keyboards. All feature 16 launch pads, two Launchpad control buttons and eight rotary controls. They also each have a 3-digit LED display, transport controls, pitch and mod wheels, sustain pedal input, transpose buttons, and more. 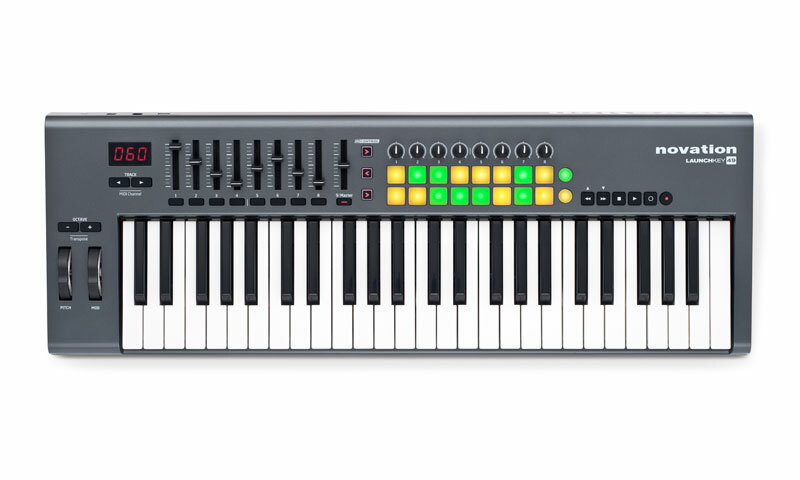 The 25-key Launchkey includes a single assignable fader while the 49- and 61-key versions feature nine, with a backlit mode button and eight mute/solo buttons. In addition to software for Mac and PC, Launchkey integrates with two powerful iPad apps. The Launchkey synth app runs on iPad 2 or later and uses Novation synth engine technology in a new and intuitive touchscreen interface. Multiple synth parameters can be controlled at once to create unique effects, while keyboard knobs tie directly into synth controls. The Launchpad app uses the buttons to trigger loops and a range of performance effects including stutter and synced filter effects.